Sometimes patients experience issues with the gums and bones of the mouth and jaw. Paris Family Dental offers corrective procedures such as bone grafts and gum grafts to resolve such issues and keep your mouth in a more healthy state. Bone loss can be caused by many contributing factors including, but not limited to, disease, tooth loss, over-brushing, misaligned teeth, trauma, age, etc. When this occurs, the area of the jawbone may not be suitable for procedures such as dental implants. Bone grafting allows our doctor to create a suitable jawbone width and height so that aesthetic appearance and functionality can be restored. Paris Family Dental offers procedures such as bone grafting / grafts that can help correct bone tissue and assure that the bite and jaws are aligned correctly and are properly set for any visual and functional improvements or future treatment needed, like dental implants. 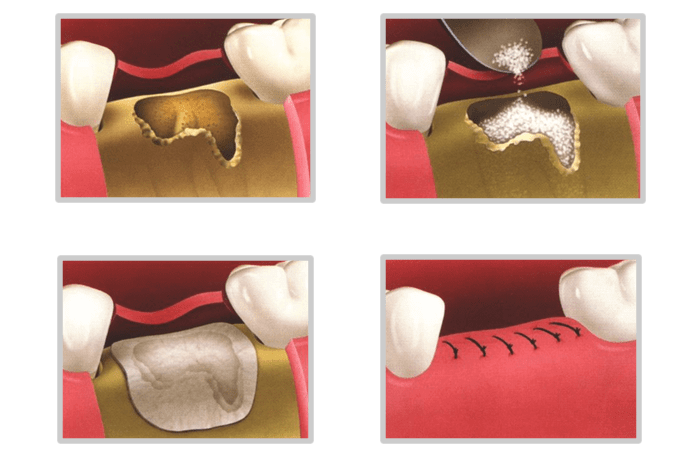 Bone grafting and bone regeneration allow us to regrow the patient’s bone tissue in areas where patients have experienced atrophy, or deterioration, of the jawbone. The bone graft is strategically placed in the area that is deficient of bone. Donated bone tissue, and in some cases bone taken from the patients themselves, is grafted in the defective areas building the bone width and height preparatory to future procedures such as dental implants. At Paris Family Dental, our bone graft procedures are what you need for your future dental implants. Gum recession can be caused by many contributing factors including, but not limited to, disease, over-brushing, misaligned teeth, trauma, age, etc. When recession of the gum (gingiva) appears, the body loses a natural protection against both bacterial penetration and trauma. 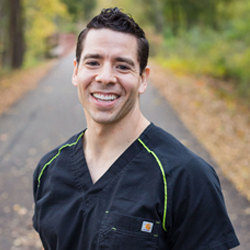 When gum recession occurs, gum reconstruction using grafting techniques is a solution we provide here at Paris Family Dental. When there is only minor recession, some healthy thick, attached gingiva often remains and protects the tooth; in this case major treatment is not necessarily required. Conversely, when recession becomes severe (reaches the mucosa), the first line of defense against bacterial penetration is lost is there is no more thick attached gingiva. Furthermore, gum recession frequently results in root sensitivity to hot and cold foods as well as an unappealing appearance of the gum and tooth. When significant, gum recession can predispose to deteriorating recession and expose the root surface, which is softer than enamel, leading to root decay and root gouging. Gum (gingival) grafting is designed to resolve these complications. The gum graft is strategically placed to cover the unprotected area of the root. A piece of donated tissue, and in some cases a thin piece of tissue taken from the patients themselves, is grafted in the recessed areas creating a band of thick strong attached gums (gingiva) around the tooth. At Paris Family Dental, our gum graft procedures are certain and result in a steady, healthy band of attached tissue around the tooth.